Bills fans the 2017 NFL Draft is less than a month away. You know what that means? It’s time to pick who you think the Bills will take first! Predict the Pick, presented by M&T Bank, gives fans the opportunity to share their thoughts on one of the NFL’s most popular events. 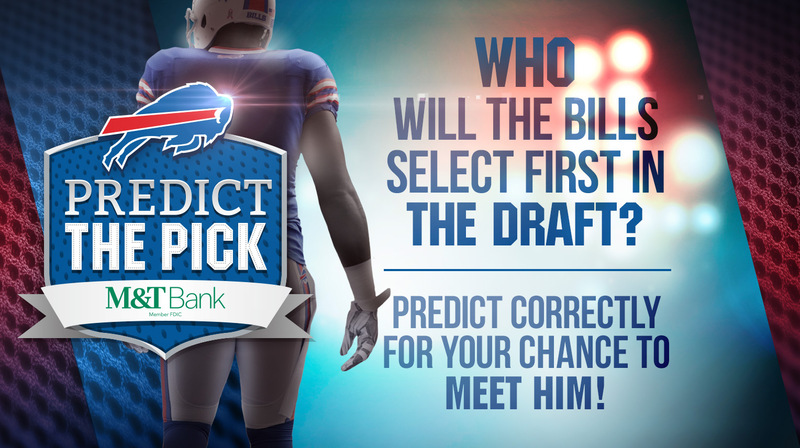 Fans who correctly predict Buffalo’s first Draft pick, will have the chance to meet him. Don’t miss out! To make your pick, click here. The contest will remain open until Wednesday, April 26 at 11:59 p.m.
NFL Commissioner Roger Goodell has given indication that the league intends to move the NFL draft out of Chicago after a two-year stint. Eager to step to the front of the line, though they won’t be ready for the 2017 draft are the Dallas Cowboys. According to the Dallas Morning News, Cowboys owner Jerry Jones is campaigning to host the 2018 NFL draft. Jones is putting together a $1.5 billion complex in Frisco, Texas that includes a 16-story hotel, an event center, a members-only club, practice fields, restaurants and retail stores, office space and an underground parking garage. The Star also features a 12,000-seat indoor stadium that local high schools can use for football games. That could also be the staging area for the 2018 NFL draft. The complex is not expected to be fully completed until the summer of 2017 as it will be completed in stages. Denver, Canton, Ohio and Los Angeles have also reportedly expressed interest in hosting future NFL drafts. There were seven offensive linemen selected last night in the first round of the NFL draft. Five of them were tackles. And as he gets set for Buffalo’s first two picks in the draft Friday night, Bills GM Doug Whaley says the ranks of the top offensive tackles have been depleted. Whaley may be talking about Pittsburgh’s T.J. Clemmings and Oregon’s Jake Fisher who went undrafted in last night’s first round. Whaley thinks there’s a potential for a run on guards during tonight’s second round of the draft. And he believes runs on positional groups usually occur around the offensive line positions. “It’s one of those things—once one goes, everybody gets kind of nervous thinking, ‘If I wait out this round, I don’t know if I’ll be able to get him next round.’ So you have to jump and pull the trigger,” he said. The entire interview with Bills GM Doug Whaley will air tonight at 7pm on The John Murphy Show. Hours away from the start of the second round of the NFL Draft, the Buffalo Bills are still interested in trading down from their 2nd round selection. GM Doug Whaley indicated yesterday the Bills are interested in talking to teams who want to move up to Buffalo’s spot in the second round, 80th overall. Late Friday, Whaley said unlike yesterday when the phones were quiet, the trade-down talk is picking up. Whaley and the Bills laid the groundwork for trade-down talks yesterday, by talking to teams they suspect might be interested in moving up to the 50th overall pick. The Bills have two picks tonight, 50th overall and 81st overall (3rd round). When the dust settled after the first round of the 2015 draft, there were seven offensive linemen off the board. And for Bills fans looking for the team to get help up front on day two of the draft, that’s probably not a good thing. General Manager Doug Whaley knew going in there would be a run on o-linemen. In an interview with The John Murphy Show late Thursday afternoon, Whaley was asked what positions might see a run. That’s how it played out. Five of the offensive linemen came off the board in a 16-pick span from Ereck Flowers (9th overall to the Giants) to D.J. Humphries (24th overall to the Cardinals). When he wrapped up the draft, Whaley sounded like it played out just as he expected. As we covered in the first installment of our ‘On the Clock’ series driven by Michelin and Dunn Tire, ‘Rise of the Right Tackle’ there were several top tackle draft choices, who began their career playing right tackle instead of the more anticipated left tackle position. From 2007-2013 here is a look at the offensive tackles taken in rounds one and two and where they lined up to start their careers. Bills need to put an end to a three-game losing streak. A win over the Jets would be a good way to go into the bye. Here is your latest edition of questions on email at AskChris@bills.nfl.net and on Twitter @ChrisBrownBills. The Bills did not seem to be using Fred Jackson and CJ spiller in the game at the same time very much when they were both healthy this season. Do you think we will ever see them utilized in a pro set or veer formation? I just could see that as a great asset to utilize in a fast paced offence. CB: Through the first 10 games I’ve got the Bills using their split back formation with Fred and C.J. on just four plays this season. They used it against the Jets in the first meeting in Week 3, so perhaps it’s rolled out again on Sunday. As for a veer offense, coach Marrone has gone on record saying that’s not something they would do here in Buffalo. I love your articles! With analytics being the buzz did anyone at the bills analyze how how many times we ran the ball between the tackles this year and got less than 4 yards a carry? Not end sweeps. CB: I can’t tell you how many rushes specifically went for less than four yards, but I can tell you after 10 games where the gains have been the most successful to this point this year. Also, do you think the Bills will consider doing any retooling at the WR position during the bye week? They seem to have 3 talented WRs in Stevie, Woods, and Goodwin. But Stevie’s production seems to have gone down since moving to the slot and Graham hasn’t been impressive so far. Goodwin seems to be faster and have better hands. CB: I’m going to let coach Marrone handle this one. Here’s what he said concerning their investment in EJ. Here’s what coach said about Manuel this week. “He needs to be out there. The more he’s out there, the better he’s getting. Also, I want to make sure everyone understands, I truly believe in this quarterback. “He’s shown that he can do it. He’s shown that he progresses during the course of the year, and during each and every play and each and every game. When I go back and look at it, I see him getting better as the game goes on. And I think that’s what you see with a young quarterback. “If we want to sit here, and I say we, it’s all of us now, and we see this young guy, we’ve got to be able to say let’s let this guy develop and let’s go, and he’s going to get better each week. I’ve noticed the Bills are lacking a big ‘go up and get it’ WR. Why has Easley seen so few offense snaps? I’ve seen him make great plays on special teams. Why don’t they try him more in the offense. He’s more physical than Graham and Goodwin. He’s still raw but they aren’t giving him the chance to see the field as WR. CB: You’re right that Buffalo does not have a big-bodied, jump ball type of receiver, which is part of the reason they’ve had a problem in the red zone of late. They have Scott Chandler, who is a height mismatch, but need a receiver that can work the corners of the end zone on fades and jump balls. Easley, even if he does not play much between the 20’s, could be part of the team’s red zone package knowing he’s a big 6’2” and 217 pounds. He should get some opportunities Sunday down there knowing Stevie Johnson and Robert Woods are out. 5 – I think Believe EJ Manuel would benefit greatly if the bills drafted a good young tight end prospect . Names Like Eric ebron North Carolina, Jace amaro Texas tech, and Austin seferian Jenkins of Washington come to mind. If the bills do not draft a te in the top half of the draft do they look elsewhere for a good te prospect such as a basketball player type . UB’s Javon McCrea who has soft hands and a huge frame comes to mind . Any Chance the bills are Looking at an option Like This ? CB: With all due respect I think you’re overlooking Chris Gragg, who finally got some measurable playing time on offense in Pittsburgh. I think he’ll also factor in on offense in the passing game this week with Woods and Johnson out. Gragg is an athletic pass catcher, who just needs time on the job. He tore his ACL in college and still runs a 4.5 40-time. There’s potential there. ESPN draft analyst Todd McShay released his Top 5 draft class list and though Buffalo did not make the top 5, they did get notable billing as well as some interesting comments related to EJ Manuel’s knee injury. McShay ranked his top five as follows. Buffalo was listed in his honorable mention category. Here’s what McShay wrote. Buffalo Bills: If EJ Manuel hadn’t gotten hurt and was able to lead the Bills to a couple of more wins, Buffalo could easily have the top-rated rookie class. But Bills fans still have to be pleased with the results. They could wind up with a starting QB, a pair of impact WRs in Robert Woods and Marquise Goodman and a star at LB in Kiko Alonso. A second-rounder, Alonso immediately emerged as a high-impact performer. His instincts, quickness, hands and high-revving motor all stand out on tape. Ultimately, the success of this class will depend upon Manuel’s durability and development. He’s seen both sides of it now. Former Bills GM Bill Polian has run draft rooms, as the General Manager of the Bills, the Panthers and the Colts. And for the last two years, Polian has covered the draft in his role as an NFL analyst for ESPN. In an appearance on The John Murphy Show Monday night, the Bills Wall of Famer said he’s just come to the realization than the draft gurus on the air, like Mel Kiper, Todd McShay, and Mike Mayock, have a much different job than the team GMs in the draft rooms.